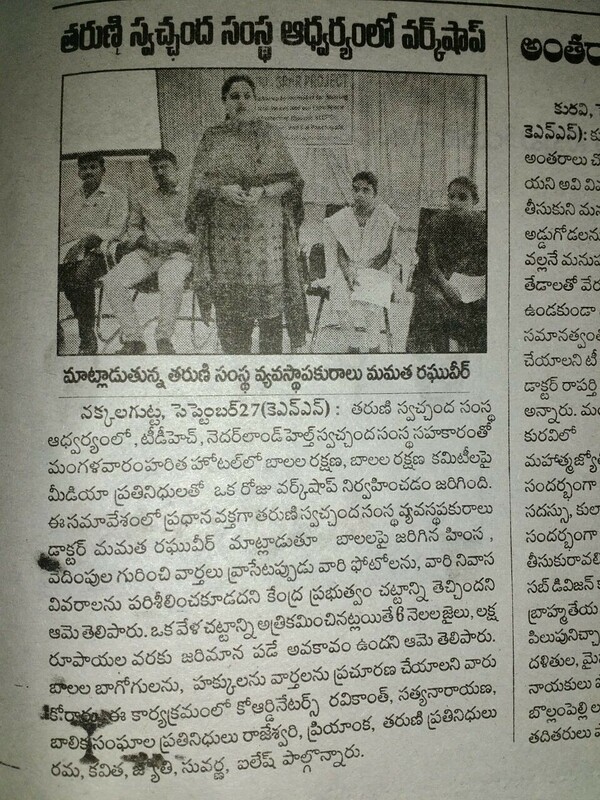 Tharuni conducted Workshop for Media Reporters and Journalists from Warangal District at Haritha Kakathiya Hotel on 27th September 2016.Dr. Mamatha Raghuveer ,Founder, 'Tharuni' explained in detail about the Child Laws and the how the Reporters have to react and report about the Children as victims of crime, or as witnesses or involved in the crime.The Children are voiceless and innocent ,Depending on the incident the journalists always keep in mind the best interests of the child.The child should not shown in the T.V. Channels and the Print Media and the identity of the child may be hidden, in his/her best interests. The child must be in the presence of his parent/ guardian, while interviewing him.Too much of questioning by different media Reporters cause him trauma and stress.The JJ Act and other Legal proceedings must be followed by the journalists always. Otherwise they will be punished and penalised with one lakh rupees fine and six months Jail under the law. 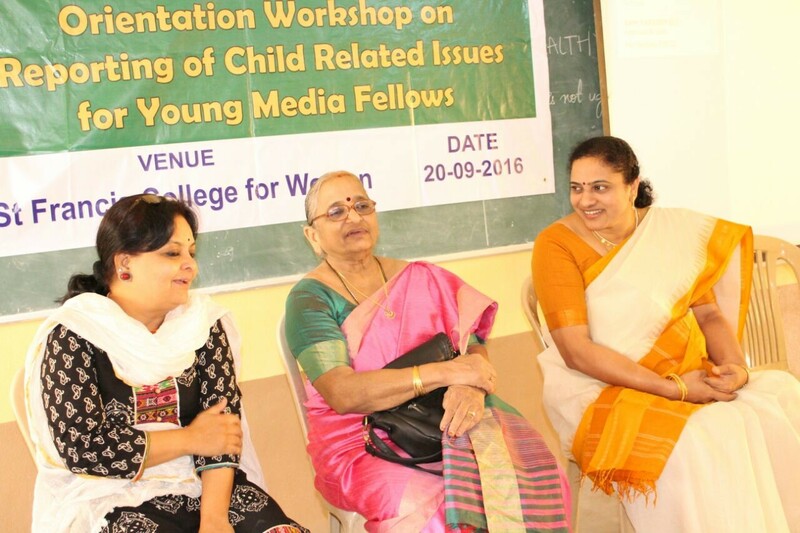 This interface Meeting was attended by different journalists of both Print and Electronic Media, and the Village Child Protection Committees, Leaders of Girls Groups Sirisha and Rajeswari and Geesukonda Sarpanch Rajkumar and the Tharuni Team Members. 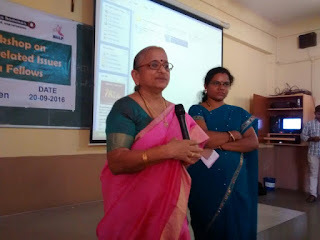 Usha Thuraga, gave an elaborate analysis of the challenges faced by the reporters, along with case studies. Dr. Hemalatha Devi Retired Prof. in Mass communications, reiterated that the Reporters as watch dogs of Society, should always bear in mind , the best interests of the Children, as they are voiceless.Dr. Antha Kaluvoya, Head of the Department organised the Workshop. More than seventy five U.G. and P.G Students actively participated in the inter active sessions. 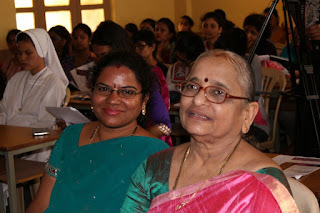 Tharuni Founder Dr. Mamatha Raghuveer and Lata Jain, Senior Journalist initiated the 'Cycle to School' Project to empower and educate the girl children. The girls can have more mobility and freedom with safety and keeps them healthy in their adolescent age, with Cycling. 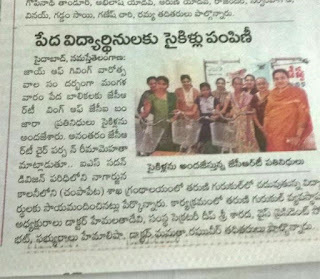 Further the drop out rate of girls from schools will come down.So Tharuni requested donors from the public to contribute for the fund raising campaign, few months back, for which there is good response.In this context Jayceerette Wing (JCI), Banjara Hyderabad, while celebrating 'Joy of Giving Week', donated three cycles to the poor students studying in the ZPHS school, Champapet. The girls are also attending 'Tharuni Gurukul' a special concept school, improving their life skills for many hundreds of poor children. Dr. Hemalatha Devi who coordinates the Gurukul and also as Director of 'Tharuni' in collaboration with JCI launched the 'Cycle to School' Program on 13th September 2016. JCRT Chair Person Reema Mehta, Secretary Deepsree Sarda, Treasurer Preeti Desoi, Lata Jain, Dr. Mamatha Raghuveer graced the occasion.The local community people, parents and children gathered and appreciated this initiative. Hope if more people come forward to contribute to this project Tharuni is planning to extend this facility to rural girl children in near future. Tharuni Hyderabad Account Number can be noted from the Website. Few Non Resident Indians have also came forward to donate for this social cause. Tharuni Face Book also acknowledging the amounts with gratitude.If the donors send their address , Tharuni sends acknowledgement receipts, which comes under IT exemption. come forward to initiate and extend this project to all the girls studying from 6th Standard in Govt. schools.It ensures gender equality and safety,and self confidence for Girls. So please join 'Tharuni Swechcha' to empower the Girl Children.